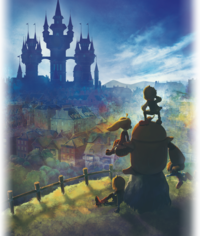 Nippon Ichi Software has published the second promotion trailer for Destiny Connect, their upcoming new RPG which will be released in Japan next month. This game will tell the story of Sherry, a girl who lives in the town of Clocknee, as she finds out that most of the town has its time stopped right before the New Year celebrations. After discovering a time travel robot named Issac in her father's room, Sherry and her friends decide to visit the past and future in order to solve the time-stopping mystery. In this trailer, you can see some footage of the battle scenes which use a command-based system. A battle party will consist of 3 characters, with a mandatory slot assigned specifically for Issac. Each character has their own unique set of skills that can be used by consuming SP accumulated per turn. Characters who are being put in reserve will still be able to get a portion of experience points after winning battles. Destiny Connect will be released for PlayStation 4 and Nintendo Switch in Japan on March 14. Despite its Western-style 3D graphics, an English localization for this game has not been announced yet.